I first made Lidia’s Bolognese almost five years ago, the night before Jeff and I ran our first half marathon. My friend Anne Marie drove in from Kansas City to run with us, and the three of us ate this Bolognese with linguini and garlic bread. Meat and carbs. How perfect. And how delicious. Anytime we’ve got a big race, this is what we eat the night before, and it never fails. It’s also great when the cold weather and short days leave you strangely famished. There are hundreds of versions of Bolognese. This one is incredibly meaty. It’s part ground beef, part ground pork. However, it doesn’t have the milk or cream that you find in most Bolognese ragus. 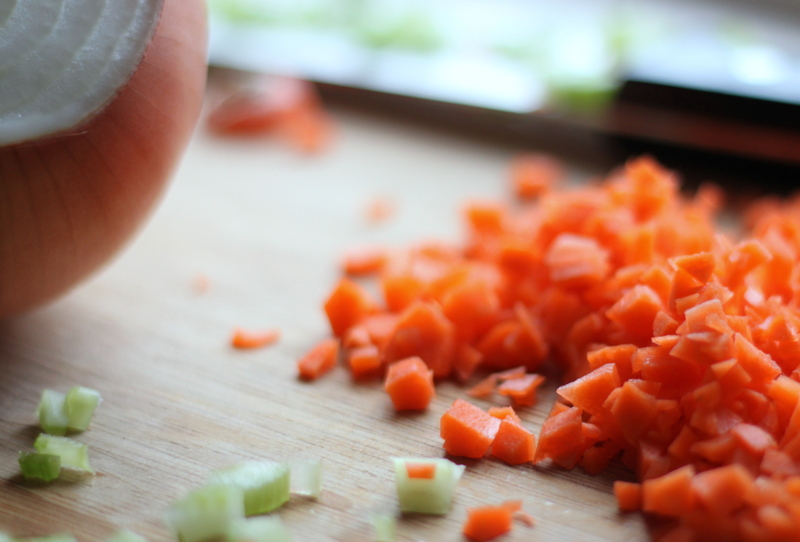 The aromatics are merely onion, carrot and celery, with three bay leaves thrown in. Hand-crushed tomatoes, tomato paste and red wine give it acidity. Aside from the taste, one of my favorite things about this sauce is how well it freezes. The recipe makes enough to dress about 1 1/2 pounds of pasta. 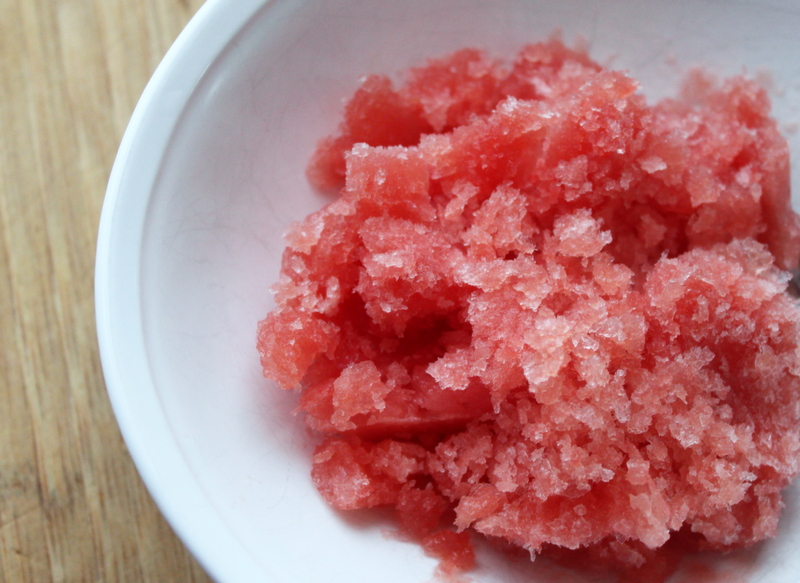 Double the recipe, freeze part of it and you’re set for several days down the road. 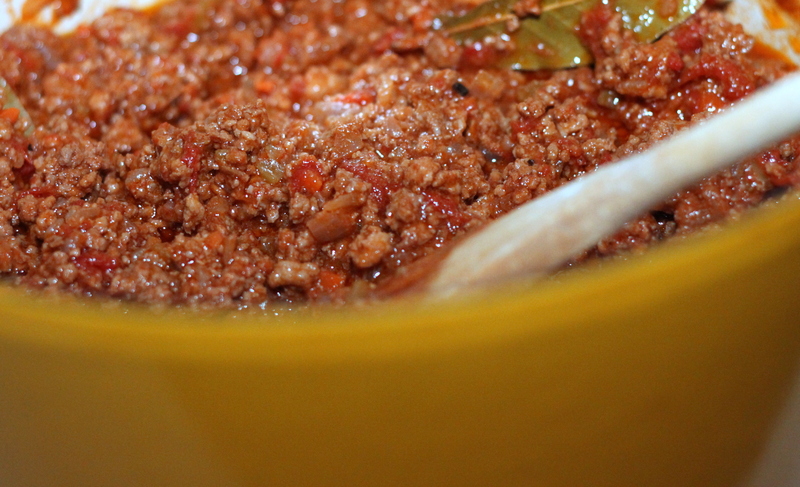 Another great thing about this Bolognese is that prep time is minimal. Once ingredients are in the pot, however, the sauce does need to simmer on the stove for at least two hours. The longer the better. 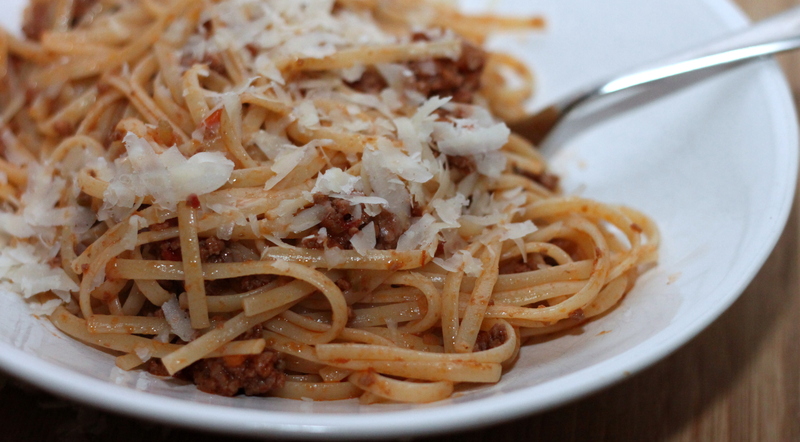 A lot has changed since we first had this Bolognese. Jeff and I bought a house. We graduated to marathon running. 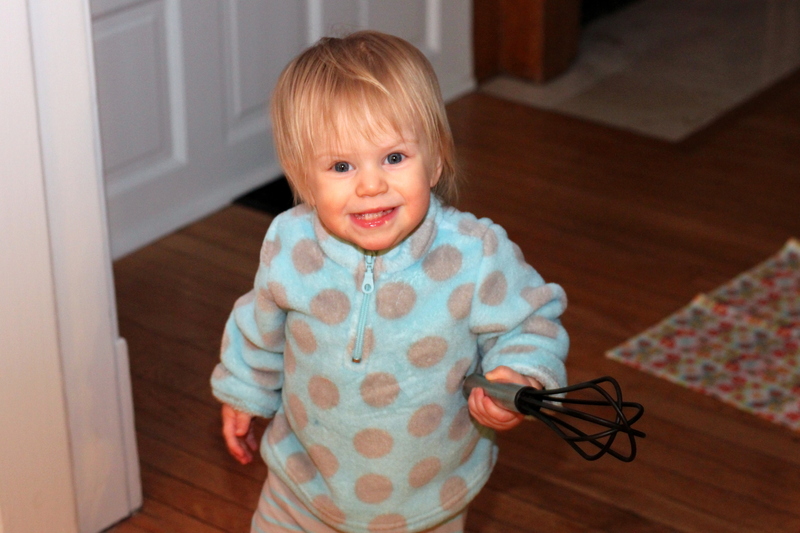 And these days, an irresistible little toddler helps me cook. Heat the olive oil in a wide 4- to 5-quart pan or Dutch oven over medium heat. Stir in the onion, carrot and celery, season lightly with salt and cook, stirring, until the onion is translucent, about 4 minutes. Crumble in the ground beef and pork and continue to cook, stirring to break up the meat until all the liquid the meat has given off has evaporated. Cook until meat is lightly browned, about 10 minutes. Pour in the wine and cook, scraping the bottom of the pan, until the wine is evaporated, 3 to 4 minutes. Stir in the tomato paste and cook a few minutes longer. Pour in the tomatoes, toss in the bay leaves, and season lightly with salt and pepper. Bring to a boil, then lower the heat so the sauce is at a lively simmer. Cook, stirring occasionally, until the sauce is dense but juicy and a rich, dark-red color. This will take about 2 to 3 hours — the longer you cook it the better it will be. While the sauce is cooking, add hot water as needed to keep the meats and veggies covered. A layer of oil may float to the top. It can be removed with a spoon or reincorporated into the sauce. To serve 2, boil 8 ounces of fresh or dried pasta. To serve 4, boil 16 ounces of pasta. Boil pasta according to package instructions. While pasta is cooking, heat sauce if necessary. Drain pasta, add to sauce, stirring to coat. (If making a smaller amount of pasta, put a smaller amount of sauce in a different sauce pan for this step.) Remove from heat and stir in grated Parmigiano-Reggiano cheese to taste. We’re on Week 2 of what seems like constant snowfall. At least five inches fell about 10 days ago. Then eight inches fell last week. Another two inches or so fell today. Yesterday afternoon, I rushed out to the store with the rest of St. Louis to stock up on bread, milk, eggs, and — ahem — cannelloni noodles. When it snows, we stay in. Gabi started walking last month. She’s not exactly ready to go bounding out into the snow. So, we spend a lot of time pointing at it from inside. Today, while Jeff and Gabi played in the living room, I cooked. I baked cinnamon raisin bread (post will follow later this week). I took my second stab at vanilla yogurt. 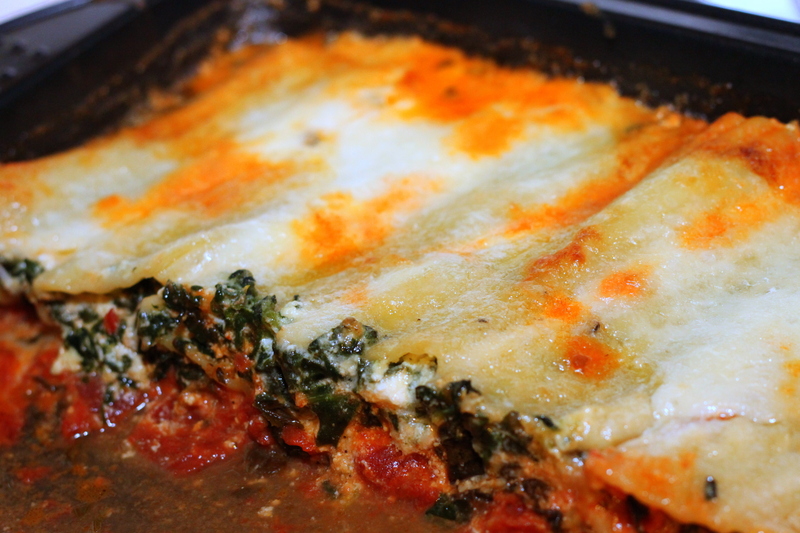 And, I make this spinach cannelloni for dinner. I’ve been thinking about this dish since summer. I bought this Jamie Oliver cookbook when the weather was quite hot — too hot for cannelloni. It’s been in my head ever since. There are several reasons to try this one. First, this is a pretty simple cannelloni recipe. No bechamel sauce is necessary. Boiling the noodles isn’t either. And, the end result is wonderful in every way. The cannelloni is warm, melty, delicious. The noodles are a bit crispy on top. The spinach and ricotta make a light and super yummy filling. On a snow day like today — it is perfect. Preheat oven to 350 degrees F. Find baking pan large enough to fit cannelloni in one layer, if possible. In a medium saucepan, heat butter on high heat. Add a drizzle of olive oil, one of the sliced garlic cloves, a handful of the chopped oregano or marjoram, and the nutmeg. Saute for about 2 minutes. Add spinach in batches. Use tongs to turn it over, and add more as it cooks down. Cook spinach for 5 minutes. Then, put the spinach into a large bowl and allow it to cool. Return the pan to heat, add a bit of olive oil, the other clove of sliced garlic, basil stalks and the chopped tomatoes. Pour tomato juice from the can into the pan. Add about a cup of water. Bring to boil. Turn the heat down, add a pinch of salt, pepper, and a pinch of sugar. Simmer for about 10 minutes, until you have a loose tomato sauce. Take the pan off the heat and add the basil leaves. Squeeze excess water from the spinach, but keep the liquid in the bowl. 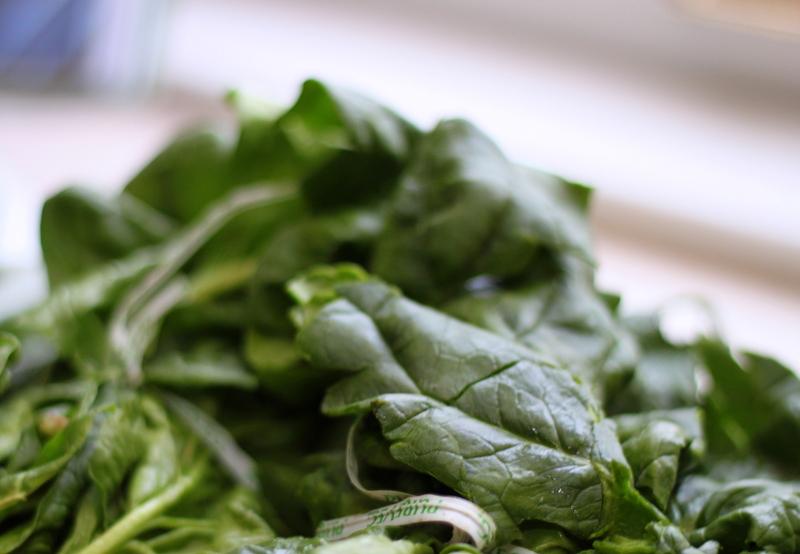 Finely chop the spinach and put it back into the bowl. Mix it with the liquid. Add the ricotta and 1/2 cup Parmesan, stir to combine. 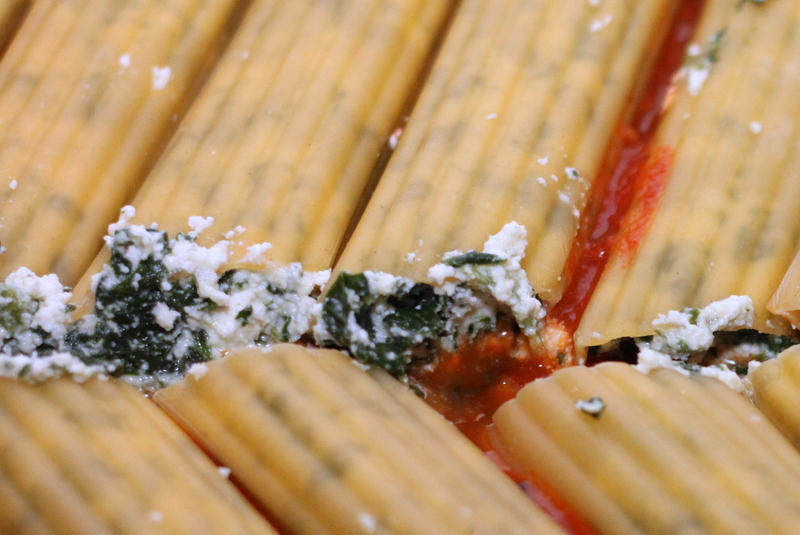 Fill the cannelloni with the spinach mixture. You can do this with a piping bag, or fill a plastic sandwich bag, twist the bag so the filling is pushed into on corner, cut a hole in the corner and squeeze. Or, use your fingers to stuff the noodles. 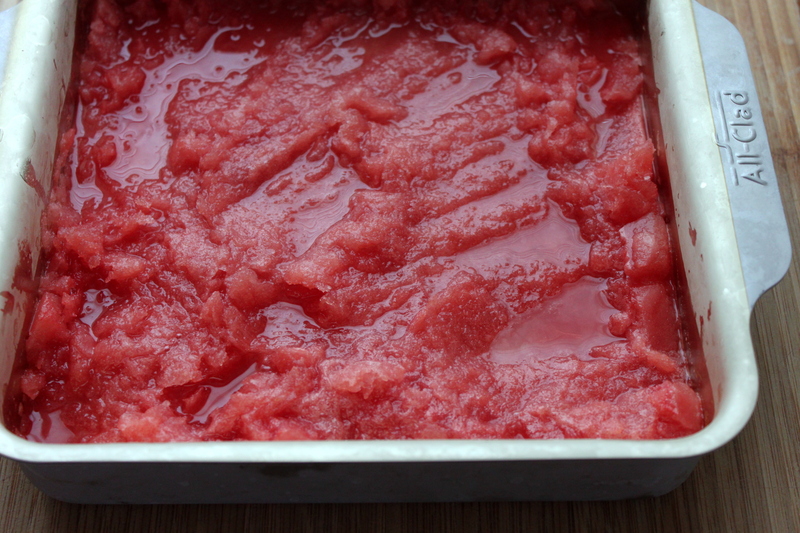 Pour the tomato sauce into the baking dish. Put the filled cannelloni on top of the sauce. Arrange in one layer so the noodles are snug. To make the white sauce, mix together the creme fraiche and the cup of Parmesan with a pinch of salt and pepper. Loosen the sauce with a little water until you can spoon it over the cannelloni. Sprinkle withremaining Parm and te mozzarella pieces, and back for about 25 minutes, until golden brown and bubbling. I know what you’re thinking. Seriously? More eggplant?? 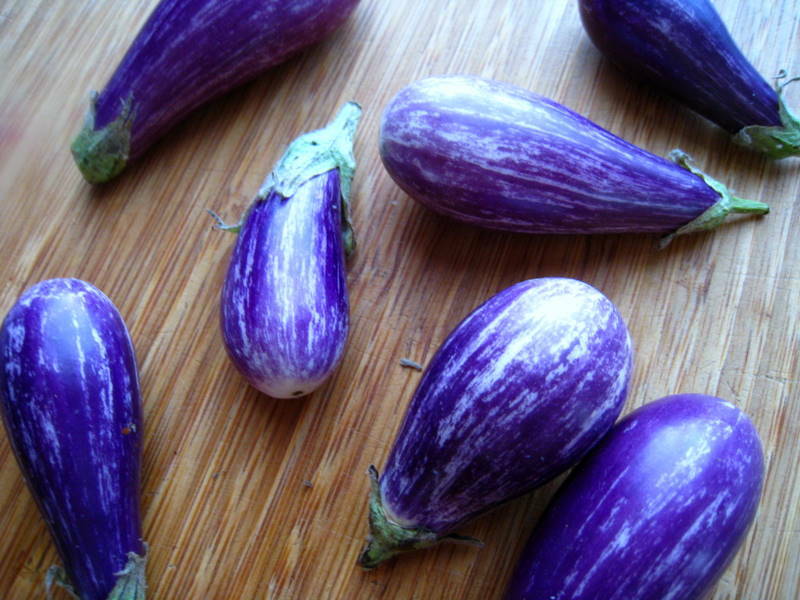 Eggplants are like bay leaves. I use them all the time but don’t really know what they taste like. 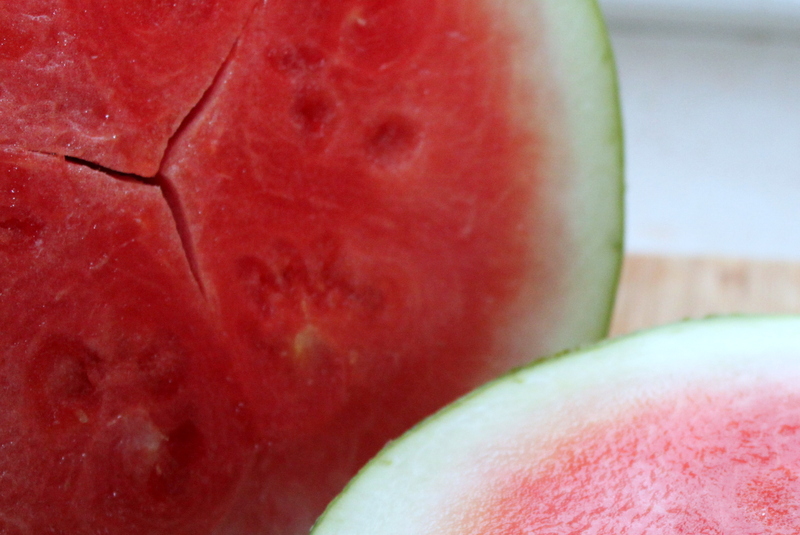 As long as they’re in season, they’re on our counter. 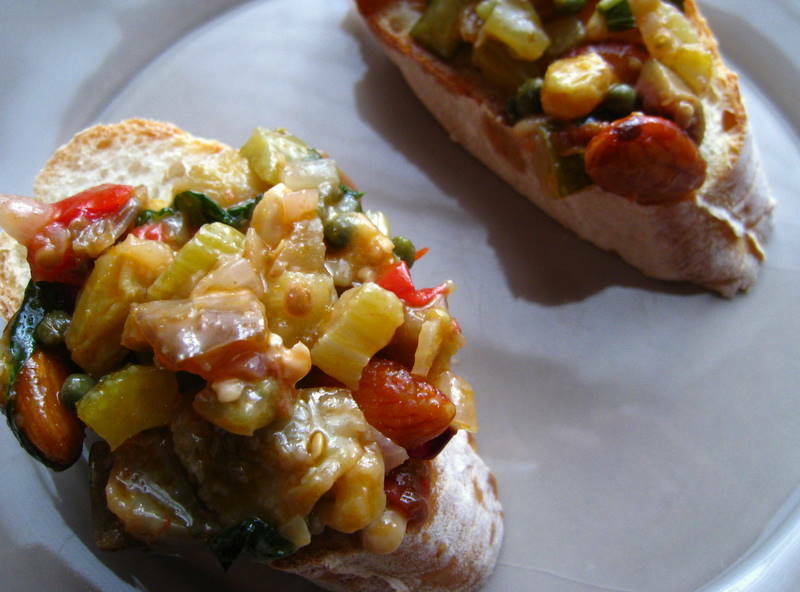 All summer, I’ve wanted to make caponata, a Sicilian dish that’s usually served as a salad or relish. 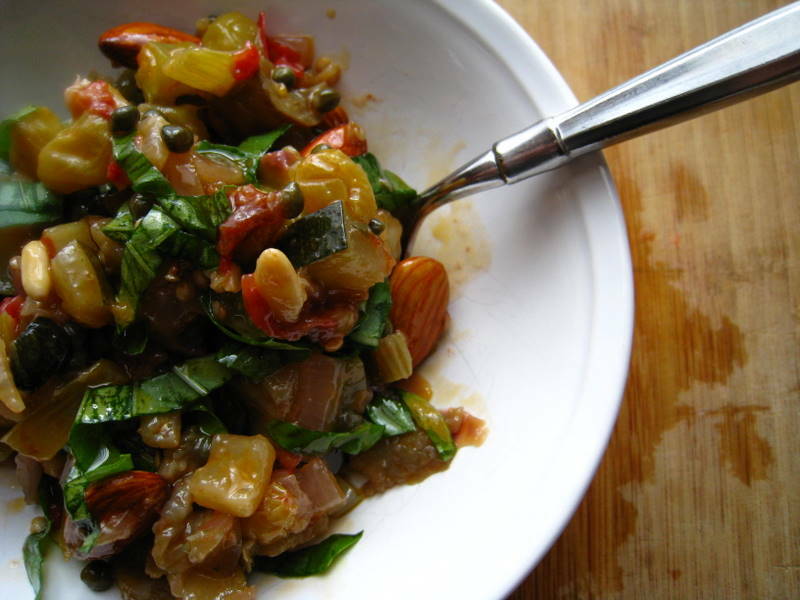 There are a gazillion variations of this, but generally it’s comprised of eggplant, onion, tomatoes, capers, olives, nuts, anchovies, vinegar and olive oil (I skip the anchovies). It’s one of those foods that improves with time. You make it, put it in the refrigerator for 8 hours or more, and then serve. This one has almonds and pine nuts, which lend a nice crunch. The flavors are strong. I prefer it on toasted bread, but you could eat it as a relish or salad. Serve at room temperature. It’s tomato season. And that means raw tomato sauces. Among my favorites: cherry tomatoes marinated in balsamic, olive oil, salt and pepper, and tossed with arugula. 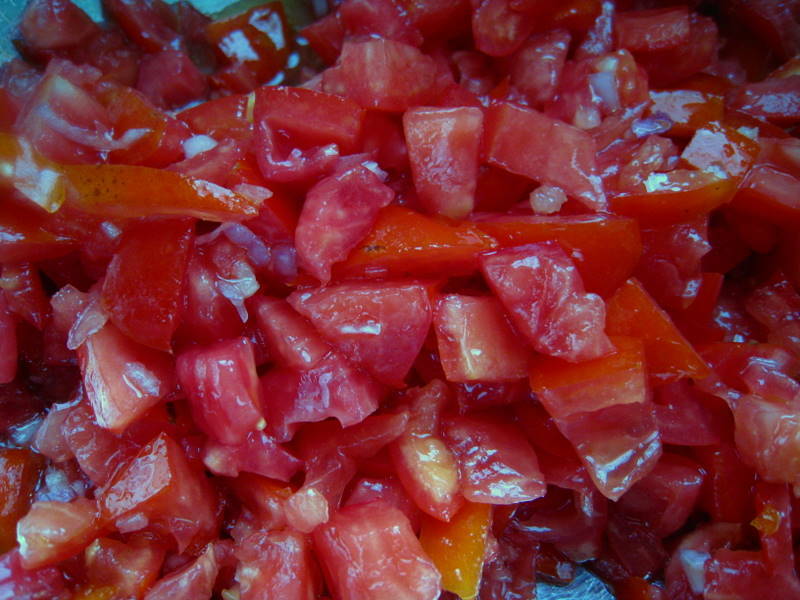 Romas diced and tossed with lemon juice, olive oil and garlic. Heirlooms chopped and mixed with olives, red wine vinegar and majoram. There are hundreds of ways. A few days ago, I used romas from our garden and several heirlooms from our Fair Shares box to make this rustic raw tomato sauce. 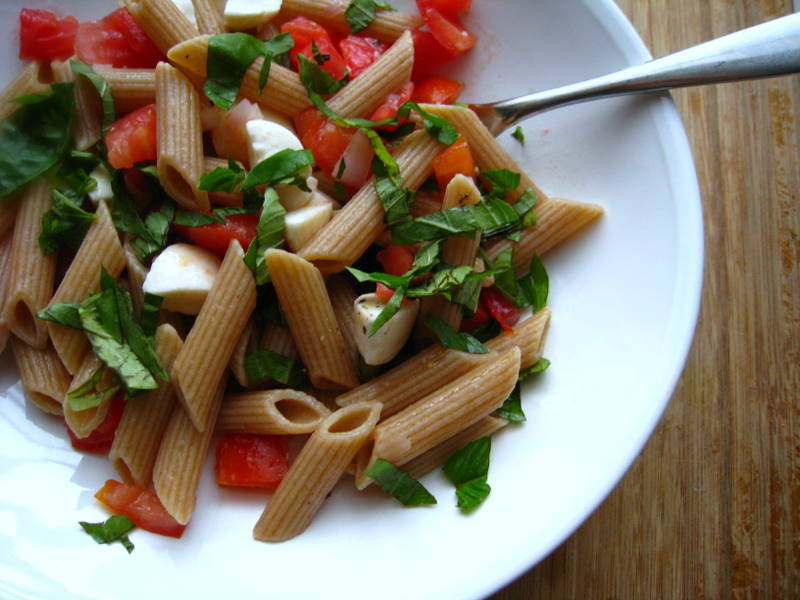 If you like caprese salads, you’ll like this. And if you have little time to make dinner, you’ll thank me for it, too. It comes together in less than a half hour, and the ingredient list is small. The success depends on quality, like so many recipes that rely on a handful of fresh ingredients. Tomatoes must be in season. Your olive oil must be good enough to stand alone. Your mozzarella must be fresh, packed in water. This is a nice way to use summer tomatoes. I ate the leftovers last week for lunch. It’s great at room temperature, or even cold, as a pasta salad. Whisk oil, 2 teaspoons lemon juice, garlic, shallot, 1/2 teaspoon salt, 1/4 teaspoon pepper together in a large bowl. Add tomatoes and gently toss to combine; set aside. 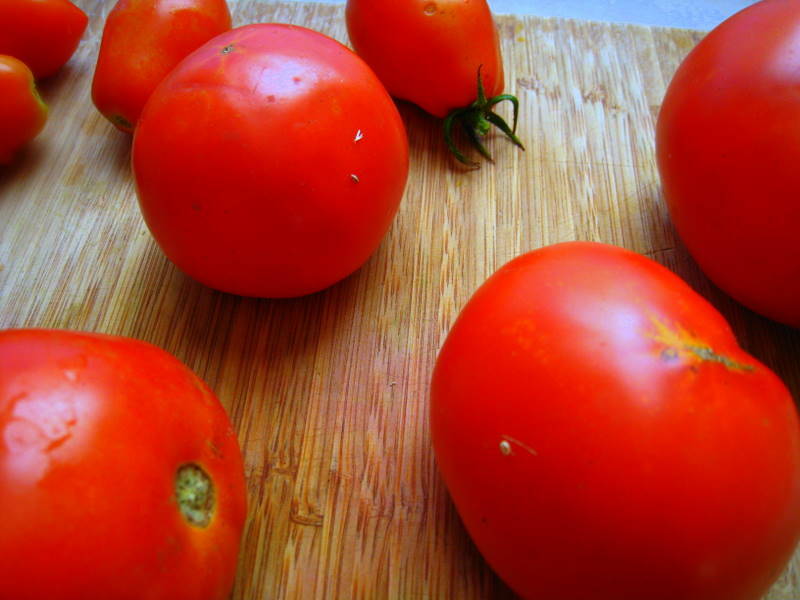 Do not marinate tomatoes longer than 45 minutes. 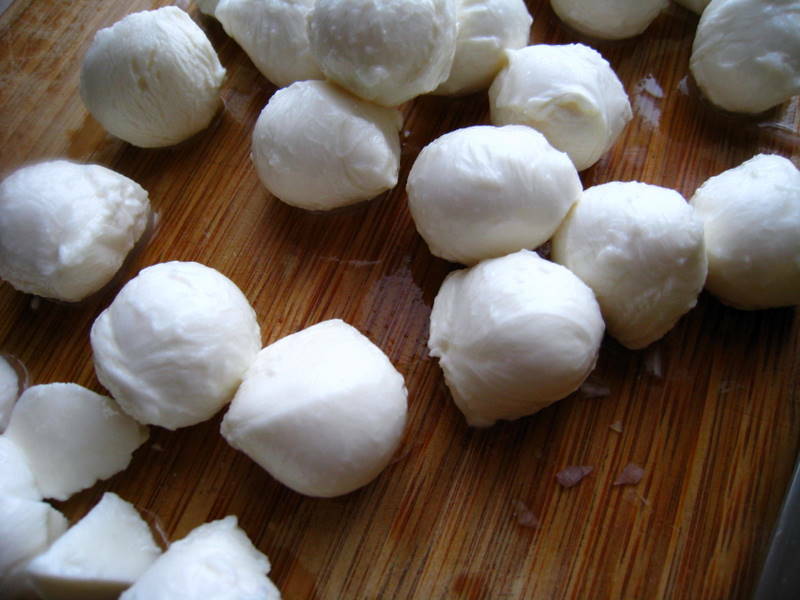 While tomatoes are marinating, place mozzarella on a plate and freeze until slightly firm, about 10 minutes. Bring 4 quarts of water to a rolling boil in a stockpot. Add 1 tablespoon salt and pasta, stir to separate, and cook until al dente. Drain well. Add pasta and mozzarella to tomato mixture and gently toss to combine. Let stand 5 minutes. Stir in basil; adjust seasonings with salt, pepper and additional lemon juice. Serve immediately. My friend Kim had a baby recently. In other words, I had an excuse to make this lasagna. I’ve developed quite an attachment to this recipe. It was first meal I made at our condo in the Central West End, shortly before Jeff and I got married. I’ve made it for special occasions, cold weekends, and whenever I crave it, like this week (so what if it’s 100 degrees outside?). Last year at this time, my friend Mark from Malaysia came over for an American cooking lesson, so to speak. He wanted to learn to make lasagna, so we cooked two batches. One we inhaled with Jeff, Elie and Chris on our deck that night, and the other went into the freezer. I brought it out about one month after Gabi was born. So once again, the opportunity presented itself. Two batches. One for Kim and Todd. The other for our freezer. Yesterday I took ours out and heated it up until the cheese started to burn slightly along the edges. 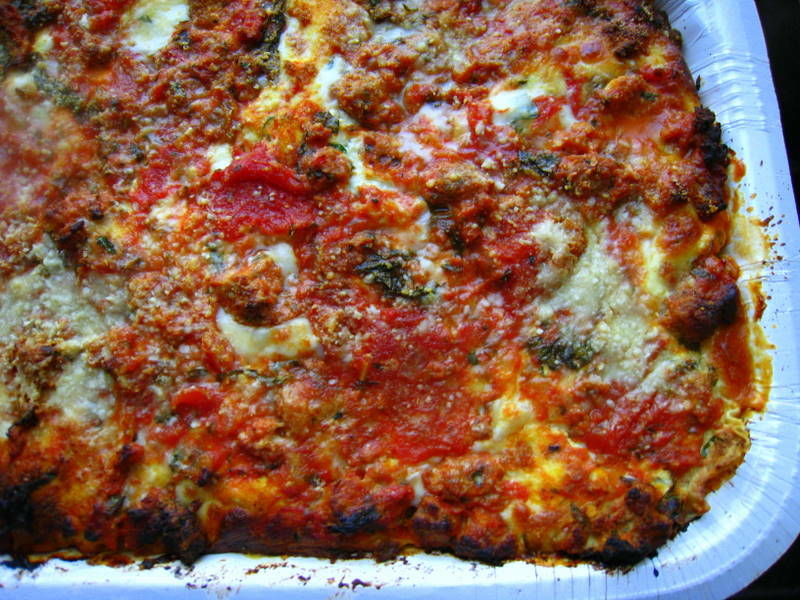 The turkey sausage-tomato sauce infuses the lasagna with hints of fennel. The ricotta cheese mixture, with parsley and basil, give it a freshness you don’t find often in lasagna. The goat cheese adds some salty tang. It all comes together in one melty, cheesy, tomatoey kiss. There are millions of lasagnas out there. I always come back to this one. It comes with terrific memories, and the taste is out of this world. Last night was a night of favorites. Jeff and I made dinner together. We had risotto. 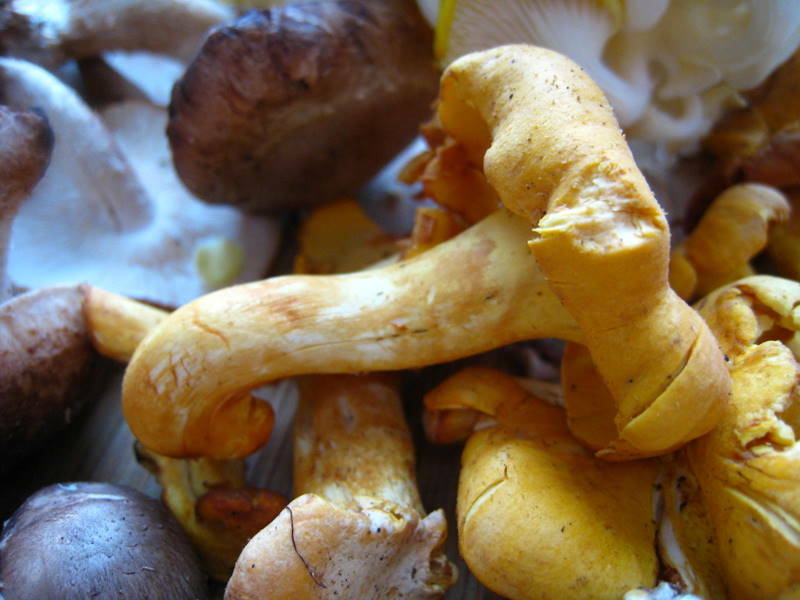 We used delicate oyster mushrooms, hearty chanterelles and shiitakes from the farmers’ market. 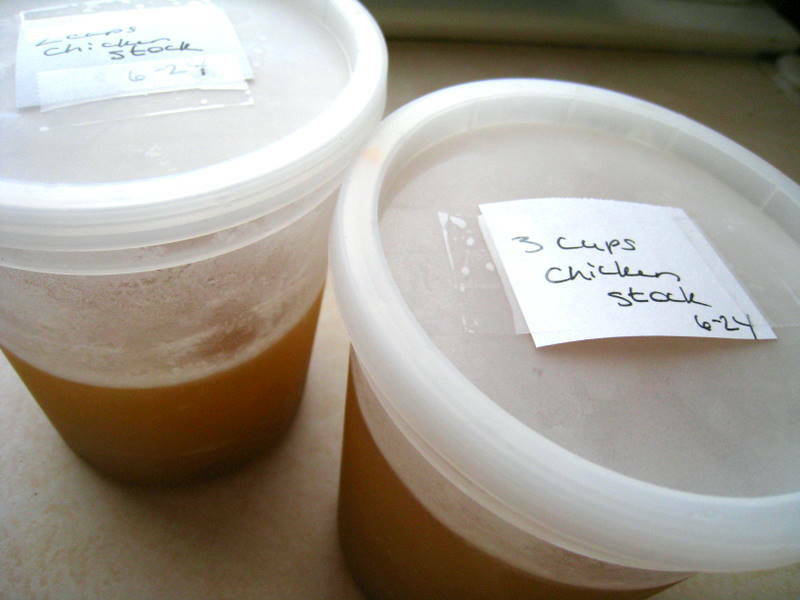 And we had homemade chicken stock, a rare treat. For a moment, the risotto took me back to our last night in Venice two years ago, when we nearly went insane looking for a particular Michelin-rated restaurant. The food we had in Italy was unbelievably good, except for the food we had in Venice. We were warned this might be the case. We needed to end our trip with a good meal, so we kept looking for this place, and we finally found it. I had risotto with squid ink. My journal entry from that night also mentions fritto misto and a creamy chocolatey dessert, but it’s the risotto I remember. 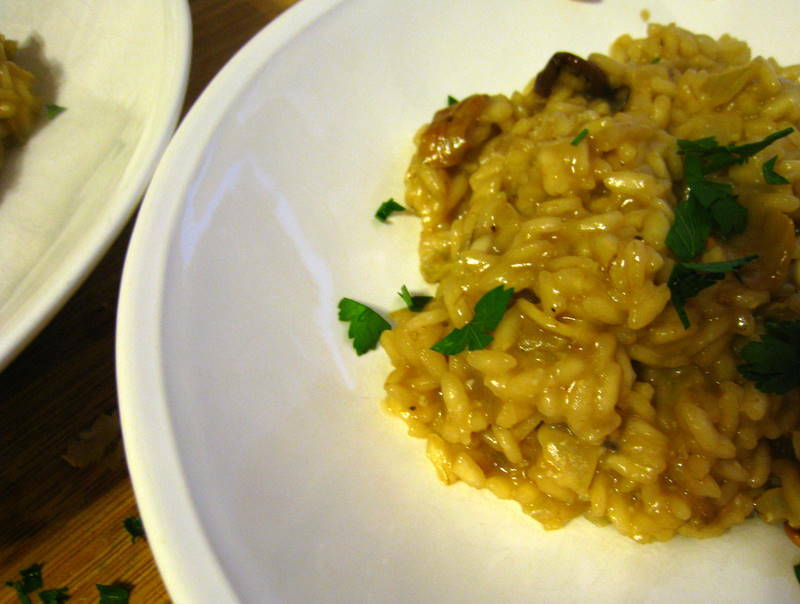 Our risotto with mushrooms last night was just as memorable, but for a different reason. There are few things better in life than to cook a meal like this with someone you love. After we put Gabi to bed, Jeff and I measured out some carnaroli rice, warmed up the stock, got the ladle ready and got to cooking. Making risotto can be intimidating. With two people at the stove — one stirring and the other grabbing ingredients and adding stock — it’s really not that hard. The risotto was creamy and mushrooms were earthy. The Parmesan added some tang. At the last minute I stepped outside and snipped some parsley for a sprinkle of green. We savored it with a nice bottle of wine and enjoyed the moment. Rinse the dried mushrooms once or twice, then soak them in hot water to cover. Put 2 tablespoons of the butter or oil in a large, deep nonstick skillet over medium heat. When the butter is melted or the oil is hot, add the onion and cook, stirring occasionally , until it softens, 3 to 5 minutes. Add the rice and cook, stirring occasionally, until it is glossy and coated with butter or oil, 2 to 3 minutes. Add a little salt and pepper, then the white wine. Stir and let the liquid bubble away. Drain the porcini and chop them, then stir them in, along with about half of their soaking liquid. Use a ladle to begin adding the stock, 1/2 cup or so at a time, stirring after each addition. When the stock is just about evaporated, add more. The mixture should be neither soupy more dry. Stir frequently, keeping the heat at medium to medium-high. Meanwhile, put the remaining butter or oil (more will make a creamier risotto) in a small skillet over medium-high heat. When the butter is melted or the oil is hot, add the fresh mushrooms and cook, stirring occasionally, until lightly browned and almost crisp, about 10 minutes, then remove from the heat. Begin tasting the rice 20 minutes after you add it; you want it to be tender but still with a tiny bit of crunch; it could take as long as 30 minutes to reach this stage. When it does, stir in the cooked mushrooms, with their butter, and at least 1/2 cup of Parmesan if you’re using it. Taste, adjust the seasoning, and serve immediately, passing additional Parmesan at the table.